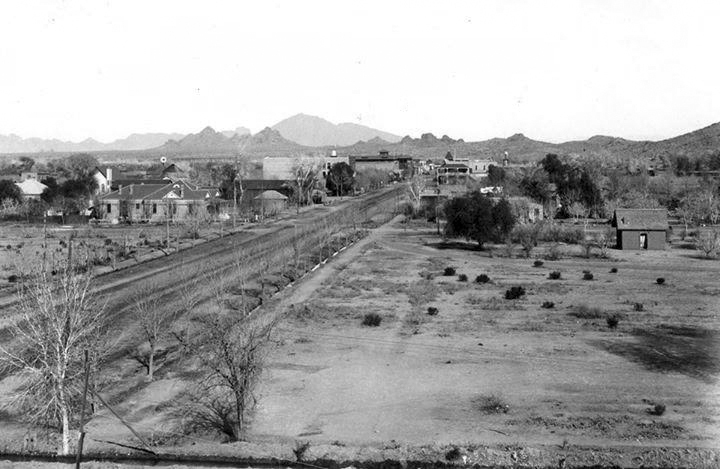 Let's take a walk down Mill Avenue in 1899 in Tempe, Arizona. We're starting from the outskirts of town, at about where University Avenue is nowadays, and we're walking north. The two-story building that we see on the right is Laird and Dines Drug Store, which is on 5th Street. This building would be "modernized" with stucco in the 1930s and then returned to its original condition in 2000. At the end of Mill Avenue is Charles Hayden's Flour Mill, which has been there since 1895. The mill building was built in 1895 to replace the original 1873 adobe building, then it would burn down and be rebuilt in 1918, and the grain silos would be built in 1951. Charles' son Carl, who graduated from the Tempe Normal School (ASU) in 1896, is now at Stanford, in California, but he would come back to Arizona to serve as Sheriff, and United States Senator. If we want to cross the river, we will need to take Hayden's Ferry, as the Ash Avenue Bridge wouldn't be built until 1913. The Papago Mountains there are still a lonely area, and dangerous for travelers. It would actually be wiser to take the train to Phoenix. Off in the distance is a mountain that looks like a camel lying down. Its nose points to the west, and the Phoenix Mountains.